Alexander MacDonald was born on the 5th of January 1912 at Tarsappie, Muthill in Perthshire the second eldest of a family of ten. Muthill was the home area of his parents Sandy and Mary MacDonald, his father being a farm servant there for a time. Alexander was also known as Sandy or more usually "Bunt" to his family and friends. It is known that his father served with The Black Watch during WW1 and received a serious arm injury on the Somme battlefield in 1916. It is likely he served with the 6th (Perthshire) Battalion - Territorial Force, who were in action in the Attacks on High Wood on 20th - 25th July. 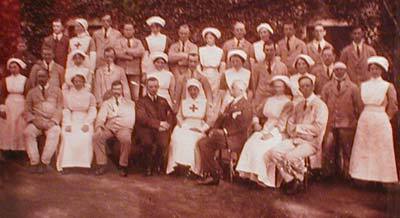 He was to become one of 540 servicemen who recuperated from their injuries in the Red Cross Auxiliary Hospital which was established in the mansion house of Leith Hall in October 1914. This small hospital, and many others like it throughout the country, provided splendid nursing care and relieved the pressure on the main hospitals during The Great War. It was ably run by the Laird and Mrs Leith Hay until it closed in March 1919. Sandy Macdonald and The Laird at Leith Hall 1916. He is still recovering from the arm injuries which ended his war service. It it well known that the Laird, Mr C.E.N. Leith Hay took a very keen interest in his patients and this accounts for Sandy MacDonald, Snr bringing his family from Perthshire to Kennethmont and working for him on being invalided out of the army. The family had no other links with the area. In the 1917-18 Valuation Roll he is the occupant of a Gardeners Cottage at Leith Hall, his occupation is given as a soldier. Still a soldier in 1919 the family are living at Rannes Cottage and by 1922 have moved to another Estate house at Pittendreigh where they remained until C.E.N. Leith Hay's death in 1939. While employed at Leith Hall Sandy MacDonald was the Laird's chauffeur and handyman. He then worked in this capacity for Major Barclay-Milne at Logie Estate, Pitcaple and lived at Whiteford. He was working as a gardener on his retiral. 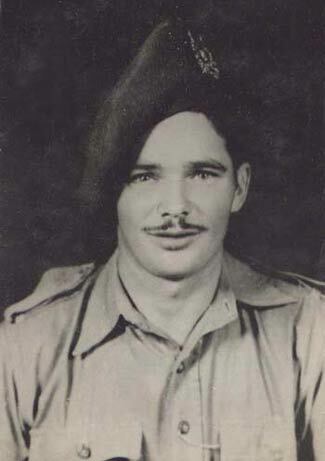 Sandy MacDonald and two of his brothers choose to join the regular army and served with The Gordon Highlanders. Hugh was evacuated home early in the war with TB and subsequently died of the disease. Jim, in the 1st Bn, also became a POW when the entire Highland Division (10,000 men) were ordered to surrender to the German General Rommel at St Valery en Caux, France on 12th June 1940. Thus began four and a half years in captivity in Germany and Eastern Europe. 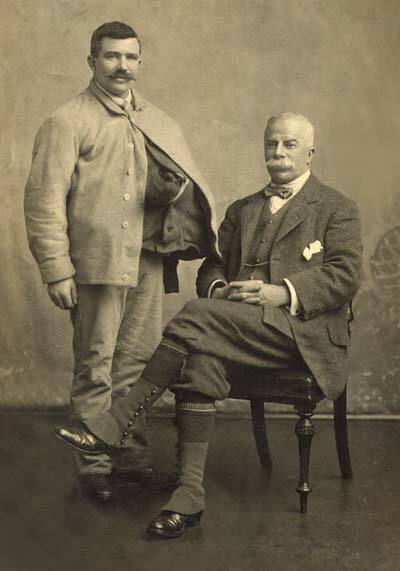 Bill and Duncan served in the Royal Navy. Their sisters Jean, Mary and Ina joined the ATS. Sandy served with the 2nd Gordon Highlanders from 31st May 1929 to 8th April 1937 and it is known that during this time he was in India. The 2nd Gordons were posted to Gibralter in October 1936. 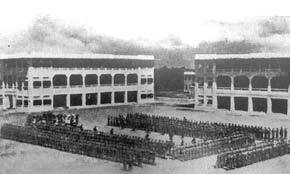 They moved to Singapore and occupied the newly completed Selarang Barracks at Changi in March 1937. On completing his service Sandy would have been liable for reserve service or recall to his battalion. 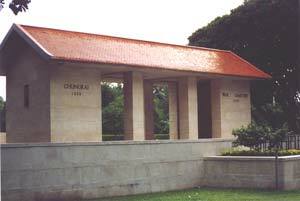 It is believed he returned to his former unit in Singapore soon after war broke out in September 1939. In 1942 the 2nd Gordons had been stationed in Singapore Fortress for four years. The battalion fought a heroic rearguard action during The Battle of Singapore as the Japanese advanced down the Malayan peninsula to Changi until the final surrender on 15th February 1942. Like their comrades of the 1st Bn who fought a similar action from Belgium to the French coast in June 1940 they now became Prisoners of War. They left Changi on 27th October 1942 as part of Lt Colonel Stitt's 'V' Party and spent five dreadful days on a train which brought them to the Chungkai Base Camp in Thailand. From here they were put to work work on the now notorious Burma-Siam railway. Built by native coolies and Commonwealth, Dutch and American prisoners of war, it was a Japanese project driven by the need for improved communications to support the large Japanese army in Burma. During its construction, approximately 13,000 prisoners of war died and were buried along the railway. As "Guests" of the Emperor of Japan the POWs suffered terrible conditions and inhuman treatment by their captors in the many POW work camps which were situated alongside the "Railway of Death " in Thailand and Burma. The first survey by Japanese engineers estimated that it would take at least 5 years to finish the 230 mile railway line, but the Japanese army forced their prisoners to complete it in only 14 months. Two labour forces, one based in Siam (Thailand) and the other in Burma started work in August 1942 and worked from opposite ends of the line towards the centre and met near Nikki on the 17th October 1943. In 1943 Nikki was the main base for seven camps of "F" Force, dispersing over a seventeen-mile stretch north to Three Pagodas Pass. Lower or Shimo Nikki, was the southernmost of the working camps allotted to "F" Force. Over half of the 230,000 POW's and forced labourers who built the railway died due to their treatment, disease, starvation and lack of medical equipment. Of the POWs, 6,540 were British, 2830 Dutch, 2710 Australian and 365 Americans perished. After the war finished 112 Japanese officers who took part in the railway construction were found guilty of War Crimes. It is said that one POW's life was lost for every sleeper laid. The original map was drawn by Phillip Cross. The kind agreement of Phillip and Carol Cooper of C.O.F.E.P.O.W. to it's use on this site is appreciated. 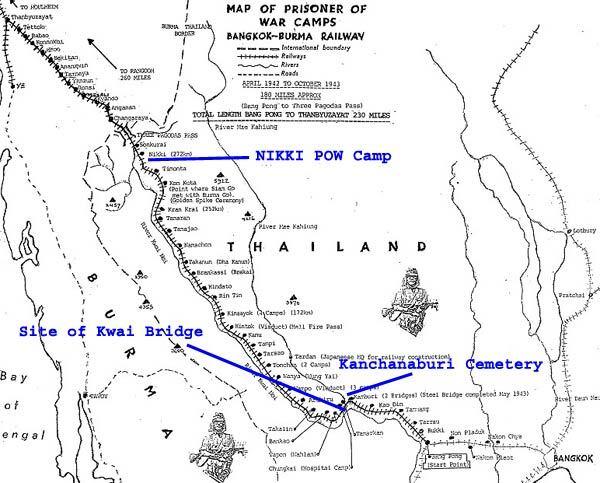 After the war those POWs who had been buried in the numerous camps alongside the railway were transferred to three new cemeteries at Thanbyuzayat in Burma and Chungkai and Kanchanaburi in Thailand. 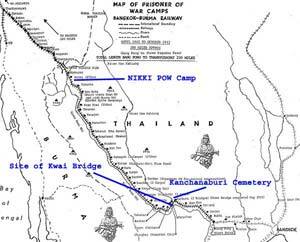 The dead from camp burial grounds on the southern section of the railway between Bangkok and Nikki (Nieke) were moved to Kanchanaburi and Chungkai. This included the ashes of 300 prisoners who were cremated at Nikki Camp to try to halt a serious Cholera epidemic in May / June 1943. 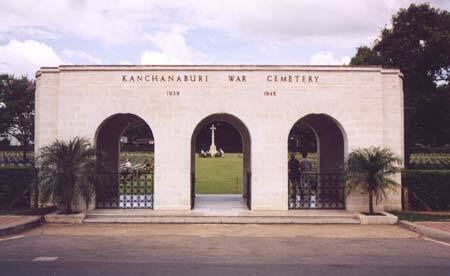 Their ashes were buried in a box in the Camp Cemetery at Nikke but were later moved into two adjoining graves at Kanchanaburi War Cemetery. Among their number were 22 Gordon Highlanders including Sandy MacDonald. 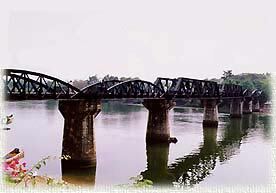 The infamous Bridge crossing the River Kwai on the Siam - Burma " Railway of Death"
Completed in April 1943 it replaced the original wooden one. The above plaque in Singapore Presbyterian Church is in Memory of 380 members of the 2nd Bn, Gordon Highlanders who died in the area and have no known grave.